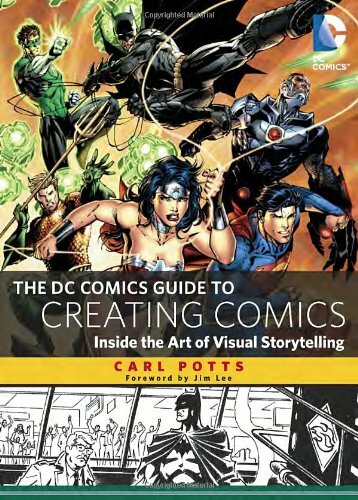 The DC Comics Guide to Creating Comics is like an advanced introduction to drawing comics. It provides a good coverage of techniques that are required for creating successful comics, and also introduces the different aspects of the creation itself. Main thing to note is the coverage is mostly theory, the actual hands-on are covered by other DC Comics Guides. The book is authored by comics veteran and authority Carl Potts who while working at Marvel, also mentored Jim Lee. The text is written in a concise and easy to follow manner. The techniques discussed are supplemented by clear examples. It's insightful and after studying them will be you not just read but also understand how other comic artists layout their pages. There are four parts to the book. The first part introduces the concept of sequential visual storytelling, what it's all about and things to look out for. Second part covers paneling. Things like how they are laid out, establishing shots, the flow, and how they affect storytelling. Third part covers comics writing using the classic arc as main example. Here it also covers artistic style and approach to drawing, giving examples of realistic rendition or the more stylistic approach such as the use of black by Mike Mignola. The last part is a walkthrough of the process of creating comics from having a script. Three professionals are given the same script and we are shown how they interpret the script and lay out the pages. There are explanations from the artists as well as analysis from Carl Potts. At 192 pages, the book has quite a lot of useful information packed in. Overall, it's a good guide for beginner comic artists, maybe it has a few useful tips for intermediate artists also. This is also a book of comic tips and theory, but the organisation is less structured, and focuses only on certain aspects. There are three, namely Storytelling, Getting Started and Advanced Techniques. These books are more in depth (well because there are 3 books total) and also cover a bit more on techniques. The books are out of print and can be difficult to find. This is more of a beginner's guide and an introduction to drawing comics. The topics are more elementary. The basic topics on creating comics are covered but could do with more depth.